I got interested in the signal that Twitter received from the two last earthquakes happening in California and Haiti. It has been recently suggested that Twitter can play a role in assessing the magnitude of an earthquake, by studying the stream of tweets that contain a reference to the event, such as the stream of messages related to #earthquake, including messages like this. The term “Twichter Scale” has been used in this context to discuss the relation between Twitter and external events such as earthquakes. While this definition does not necessarily imply that the Twichter scale indicates the magnitude of earthquakes, it is interesting to ask whether Twitter data can be used for that purpose. When we look at the data, we can clearly identify both earthquakes represented as spikes in the data. Both earthquakes were comparable in terms of Magnitude (6,5 vs. 7.0 on the Richter Scale). And in fact, both events produced a comparable amplitude for the #earthquake hashtag stream. On the surface, this might be a confirmation of the idea of a Twichter Scale, based on the Richter Scale, which is a scale measuring the magnitude of an earthquake. The Richter scale produces the same value for a given earthquake, no matter where you are. However, there is another, less scientific measure to characterize earthquakes – the so-called Mercalli scale – which is a measure of an earthquake’s effect on people and structures. Which yields to the interesting question, whether Twitter streams can better serve as an indicator of strength (Richter) or impact (Mercalli) of an earthquake? As we can see in the figure, the amplitude produced on Twitter is approximately equal for both events (almost 400 messages per hour). My suspicion however is, that this is not because Twitter accurately captures the strengths of earthquakes, but because the Jan 9 earthquake was closer to California, where more people (more Twitter users) are willing to share their experiences. So it seems that this produced an amplitude of similar extent, although the impact of the Jan 9 earthquake in California on structures and people was much weaker than the impact of the Jan 12 earthquake in Haiti. So how can we identify the difference of an earthquake in terms of its impact on people and structures? When we look at the diagram above, we can see a clear difference after the initial spike: While the Californian earthquake did not cause many follow-up tweets, the aftermath of the Haiti earthquake is clearly visible. What does that say about Twitter as a signal for earthquakes? The amplitude of the signal on Twitter is very likely biased by the density of Twitter users in a given region, and thereby can neither give reliable information about the magnitude nor the impact of an earthquake. This suggests that Twitter can not act as a reliable sensor to detect the magnitude of an earthquake in a “Richter Scale” sense. 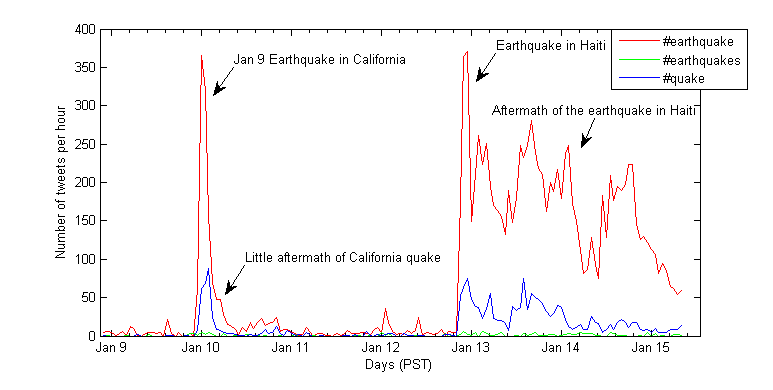 However, the “aftermath” of a spike on twitter (the integral) seems to be a good indication of an earthquake’s impact on people and structures – in a “Mercalli Scale” sense. Long after the initial spike, the Haiti earthquake is still topic of conversations on Twitter (those are likely related to fundraising efforts and other related aid activities). Indepentent of the density of Twitter users in Haiti (which is probably low), the aftermath can clearly be identified. Using the aftermath (not the amplitude) of twitter stream data, the impact (not the magnitude) of earthquakes becomes visible on Twitter. Carlos Castillo, Marcelo Mendoza, and Barbara Poblete. 2011. Information credibility on twitter. In Proceedings of the 20th international conference on World wide web (WWW ’11). ACM, New York, NY, USA, 675-684. Update IV (2017): The Twicalli Scale has been implemented in a decision support tool by the National Seismology Office in Chile, See the corresponding SIGIR poster below. Poblete, Barbara. “Twicalli: An Earthquake Detection System Based on Citizen Sensors Used for Emergency Response in Chile.” Proceedings of the 40th International ACM SIGIR Conference on Research and Development in Information Retrieval. ACM link, 2017. I am alarmed that my tweet was taken as a serious suggestion. ;-) You should cf Matt Hurst’s frequent blog posts looking at tweetstreams for current topics. Also, not to diminish what you’re trying to achieve, but the datastream in the wake of the Haiti disaster is not a good comparison, because telecom is essentially dead on much of he island. So you’re comparing tweets experiencing an event to tweets discussing an event happening elsewhere, which is different. I think the photos from Haiti strike me so strongly I can’t think of it in a research context. Thanks for your comment. The aftermath should be indepedent of the type of event, because whenever help is required after an event, it is likely that there will be more activity (even if there is no telecom infrastructure at the location itself). I feel that it is difficult to think about research in this context as well. At the same time though, I think that Twitter can really play an important role in such tragic events, by for example helping to detect them, or by mobilizing people to donate money. And looking at this kind of data might help to come up with new algorithms and tools to alleviate suffering and to coordinate aid in future events. I have to point out that a difference of 0.5 on the Richter scale corresponds to three times the energy, and furthermore, distance from the epicenter to developed areas also plays a role in the energy that is delivered to the structures. In short, the earthquakes aren’t directly comparable. A better comparison would have been between the recent Eureka quake you used and the Bay Area quakes that preceded it by a couple of days. I agree with Ian that the Twitter traffic confounds several variables, and that it is highly non-linear in terms of representing real-world events. It would be interesting (at a sufficient remove in time, perhaps) to compare the character of Twitter message patterns for major events by event type to see if there are important differences between (for example) natural disasters and man-made ones. On the other hand, I don’t know what the point of looking at the Twitter response past the initial “event detection” phase actually is. Gene, thanks for highlighting that the Richter scale is not linear, I should have pointed that out. I think the difference between the Eureka and the Haiti quake is interesting because in one case there was almost no damage to structures and people, while in the other case there is (one would not be able to study this difference with the Bay Area and Eureka earthquakes). And the aftermath of the Haiti spike shows that Twitter is perceptive for that. This makes Twitter seem more indicative of Mercalli than Richter. In addition to detecting events, characterizing the aftermath of events might be a way to approximate the damage caused by an event, or the degree to which people are mobilizing, which seems to be interesting information.